1 Hans Eysenck’s contribution to our understanding of personality and psychological disorder: a personal view. 2 The relationship between incentive, personality type and improvement in performance of imbeciles. 3 Sedation threshold, personality, and the theory of neurosis. 4 Why drug effects vary. 5 The relative influence of weight and of "nervous type" on the tolerance of amylobarbitone sodium..
6 Animal models of schizophrenia: the case for LSD-25. 7 Covariation between two-flash threshold and skin conductance level in first-breakdown schizophrenics: relationships in drug-free patients and the effects of treatment. 8 LSD: a missed opportunity? 9 The schizophrenias as nervous types. 10 Theoretical background and issues. 11 The factor structure of ‘schizotypal’ traits: a large replication study. 12 The Oxford-Liverpool Inventory of Feelings and Experiences (O-LIFE): further description and extended norms. 13 Schizophrenia risk and handedness: a mixed picture. 14 Creativity: a healthy side of madness. 15 Psychotic traits in comedians. 16 Old thoughts: new ideas: future directions. Gordon Claridge is Professor of Abnormal Psychology at the University of Oxford Department of Experimental Psychology and Emeritus Fellow Magdalen College, and a Fellow of the British Psychological Society. 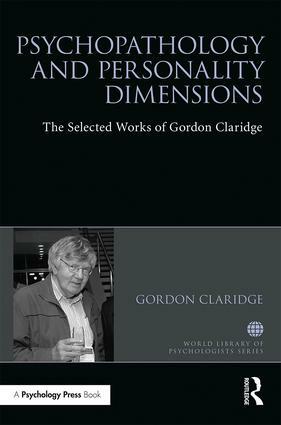 Over an exceptional career spanning nearly sixty-five years, and as a past President of the International Society for the Study of Individual Differences, he has been at the forefront of research around the theme of schizotypy, investigating, from several different angles, the major psychological disorders, adopting a psychometric, dimensional, predominantly biological approach.